Another addition to the fast growing Village Signs series. You are looking for a Magnetic Key Cache. 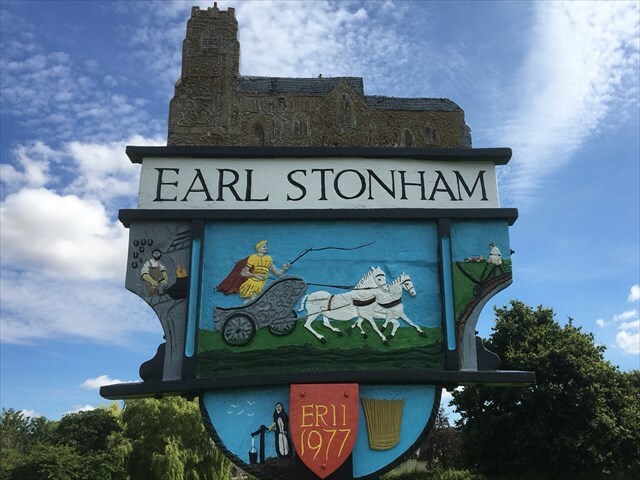 The Manor of Earl Stonham was an area of land allocated to a lord by the King William the Conqueror after the Battle of Hastings in payment for services. At the time of the Domesday Book, 1086, the Manor was owned by Roger le Bigot and was passed down the line to Roger Bigod 5th Earl of Norfolk who died in 1305, hence the name Earl Stonham. The Manor had and still has four greens: Middlewood Green, Broad Green, Wicks Green. Forrolde (now Forward Green), this last named being where this Village Sign now stands. Haqre zrgny onfr ng erne bs fvta.